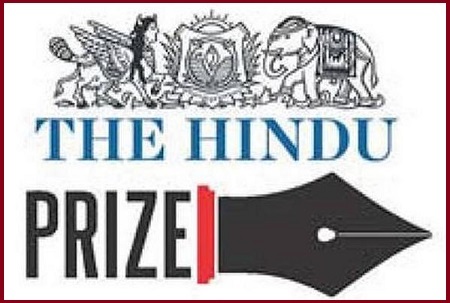 The Hindu Literary Prize 2018 was awarded during The Hindu Lit for Life 2019. 1. English writer Neelum Saran Gour, author of Requiem in Raga Jankibagged The Hindu Prize 2018 for Fiction. 2. Activist Manoranjan Byapari, author of Interrogating my Chandal Life: An Autobiography of a Dalit, bagged The Hindu Prize 2018 for non-fiction. 3. The Hindu Young World-Goodbooks Award for Best Book Fiction to Venita Coelho for Boy No: 32. 4. A Brush with Indian Art of Mamta Nainy received The Hindu Young World-Goodbooks Award for Best Book Non-Fiction. 5. Vinayak Varma’s Angry Akku received The Hindu Young World-Goodbooks Award for Best Picture Book: Story. 6. Rajiv Eipe’s Ammachi’s Amazing Machines received The Hindu Young World-Goodbooks Award for Best Picture Book: Illustration. The Hindu Literary Prize was instituted to honor writers who have spent their lifetime mining the human spirit through their words and ideas. The idea of the Hindu Literary Prize was mooted in the 20th year of the Literary Review.